Alongside white and grey ladies, the 'monk' has to be one of the most symbolic of ghostly legends around Britain. Such figures signify the peace and tranquillity of old abbeys and priorys, as they walk or glide, like shadows, adorned in their cowls, along ancient pathways flanked by ruinous walls. These ghosts are of too recent an origin for any traditional story to explain their haunting. Until a century ago it was a small village and noted for the piety of its inhabitants. 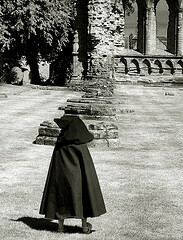 In the seventeenth century it was a centre of Puritanical zeal; possibly the phantom monks were the victims of persecution of their order. St Bartholomew the Great is the oldest church in the capital. What's left of the priory was founded by a monk named Rahere, also said to have founded the adjacent hospital. It is said to be his ghost that loiters in the grounds, particularly around his own tomb and effigy. Other researchers disagree and claim the monk phantom is a martyr once burned in the area of Smithfield, not far from the church. This particular haunting is one of peace though, as are a great deal of monk ghosts. Despite their creeping, silent and shadowy image, tales of wicked monk spectres are few and far between, which is a good thing, as it's the last thing you'd wish to be confronted with on a dark and stormy night in the grounds of an old churchyard.